Lice are a tiny, wingless parasitic insect that live on human scalp. These tiny creatures feed on small amounts of blood drawn from the scalp. This six-legged parasite is about the same size of a sesame seed and is very difficult to spot in the hair. Adult and immature lice look similar in appearance. Adult lice are 1/10 inches long and gray in color while nits are white when laid and then turn brown before they hatch. These tiny parasites cannot fly and jump. They have specially adapted claws that allow them to cling firmly to the hair. Head lice infestation is very common in in kids aged 3 to 12 years. It is transmitted by crawling from head to head or by sharing hairbrushes and hats. Lice do not pose any health hazard, but they are contagious and can be extremely annoying. The lice bites can become itchy and inflamed. Persistent scratching can lead to skin irritation and infection. Lice should be treated as soon as possible as they spread easily from person to person. It can be very annoying and unpleasant, but you can easily get rid of them with diligence. Itching a scraping the head are the most common signs of life. The itching occurs around the nape of the neck and behind the ears. These symptoms can also be caused due to other factors. Pediculicide is the quickest way to combat head lice. There are some pediculicide formulated to kill the head lice and eggs, while some kill only the crawling lice. Apply the treatment on the hair and scalp, according to the instruction mentioned on the label. Allow the treatment to sit for an hour and wash it off using water. Do not use shampoo to wash the hair. There are combs especially formulated to remove lice and nits from the hair. This fine tooth comb is called nit comb. Nit combs are extremely handy as they are specially designed to pull the lice and its eggs from the hair. Divide the hair in sections and pull the comb from the roots to the end section of the hair. Continue combing until all the sections are combed. ed lice treatments may kill the lice, but the itching will remain for a few days. Follow the directions on the products to ensure that the treatment works properly. lice disappear. Wetting the hair is recommended as it immobilizes the lice, while the conditioner makes it easy to comb the hair. 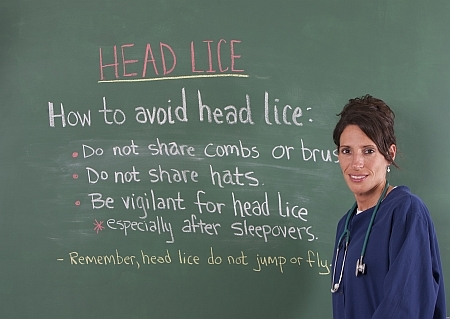 Monitor the hair closely after every 8 hours to notice any signs of new lice. 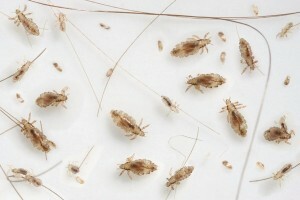 Lice hatches in cycles and it is nearly impossible to get rid of them in a go. Do a thorough combing every 8 hours for the first 3 days. Continue checking the scalp every 16 hours and comb when necessary. Most of the lice treatments require a second application after a few days to kill the remaining lice that might have hatched since the initial treatment. ounter products. This has made the eradication much more difficult. Natural remedies can largely help you to get rid of lice. These remedies will come handy, especially when you are sensitive to chemicals. Melt 1/4th cup of neem oil and mix it with 1/4th cup of coconut oil. Massage the oil into your scalp and hair and leave it overnight. Both the oils have antibacterial properties that can help to get rid of the lice. Use a nit comb to work through the oil treated hair. This will help the nits to come off easily. Apple cider vinegar is an extremely effective way to get rid of nits and lice. Mix half cup of water and half cup of apple cider vinegar. Use the solution as a hair rinse. Then, comb the hair using a nit comb to remove the nits and lice. There are certain essential oils that are effective in eliminating the head lice. The essential oil that can help you treat lice are, Oregano, peppermint, aniseed, cinnamon leaf, clove, nutmeg lavender, rosemary, thyme, tea tree and eucalyptus. Mix two ounces of water with 20 drops of any of the above-mentioned essential oil. Apply the solution using cotton balls. Leave it overnight or at least for 12 hours. You can also mix essential oil with rubbing alcohol. Transfer the mixture to a spray bottle and saturate the hair with it every 12 hours. Comb the hair properly using the nit comb and then shampo it. You can also use the solution as a preventive measure. Saturate the hair, scalp with mayonnaise and then put on a shower cap. The lice will be dead by the next morning. This treatment will kill the lice, not its eggs. Petroleum jelly is also useful for treating the crawling lice. Apply a thick layer of petroleum jelly on the scalp and then cover with a shower cap. Leave it overnight and use a mineral oil to remove the petroleum jelly and the lice along with it. Repeat this method several times a week. Rosemary has been found to be very effective for reducing the spread of head lice. Place 2 to 3 sticks of fresh rosemary in your pillowcase or underneath the case. The smell of rosemary will repel the lice. Body lice are often found in the seams of clothes. They feed on human blood and are larger than the head lice. They are usually found in people who stay in close quarters and where people do not have access to bathing and washing facilities. Throw out the infested clothes. Lice live up to a month on clothes. Hence, you need to throw them out before they spread to other clothes. Take regular baths and always use a medicated soap for cleaning the body. Wash the beddings, linens and clothes regularly. Medicated creams that contain malathione, Permethrin and benzoyl alcohol can help treat the itching. Personal items that encounter the head should be disinfected for further use. Wash the lice infested clothing and bedding properly after the initial treatment. Wash the pillowcase, bed sheet, clothes, stuffed toys and any other fabric in hot water. Lice generally do not live once they jump off a person’s hair, but it is necessary to take preventive measures. There are certain things that cannot be soaked in hot water. Seal the non-washable items in a plastic bag for two weeks and place it in direct su light. You can also keep the items away from the child until the lice is gone. For other items, use a spray specially designed to kill lice. Make sure you wash the entire towel properly after using it. Soak the towel and clothes in a 10% bleach solution for 30 minutes and then rinse very well. Sanitize the comb by putting it in a bowl or warm soapy water. Lice and the eggs die when exposed to 128 degrees Fahrenheit for 5 minutes. Once you have eliminated the lice, it is very important to take precautions to prevent it from recurring. Re-treatment is a part of the complete lice removal treatment. The complete elimination treatment should be repeated in every 10 days after the initial treatment. Inspect the hair carefully for at least 2 weeks. Do not borrow hair combs or brushes from someone. You should always keep a personal comb for your use. Do not share your hat or cap with anyone. Vacuum the car seat cover every day, where we mostly rest our head. Do not shampoo the hair for 2 days after using the medicated treatment. 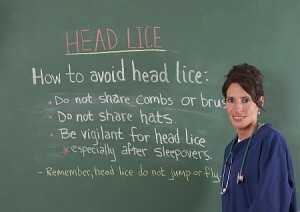 Also, do not use more than one head lice medication. Do not use a hair dryer after applying any of the chemical products as they contain inflammable ingredient. Use a flat straightener over the nits. The heat will kill those little pests. Try not to scratch the head. Scratching will make it scalp itchy, making the bite worse. Never use insecticide spray to get rid of the lice. It can be very harmful. Do not use a medication for more than 3 times on one person. It the treatment fails to work, and then consult a doctor.